After five years of service to the community as coordinator of The Jason Miller Playwrights’ Project at Scranton Public Theatre, I have decided to step aside and focus on my own writing for a while. It has been an honor to work with those of you who entrusted your scripts to our care or who as actors and technicians helped breathe live into so many diverse characters. I am likewise indebted to each and every one who purchased a ticket or made a donation in support of our crazy vision. I couldn’t be more proud of the theatre we’ve created together. It is my understanding that the program will continue forward in its mission to procure and develop new theatrical works by local writers. I hope that you will continue to support the project’s initiatives and new, original work created in and for this region, in general. Don’t hesitate to contact Scranton Public Theatre at 344-3656 if you have any questions. 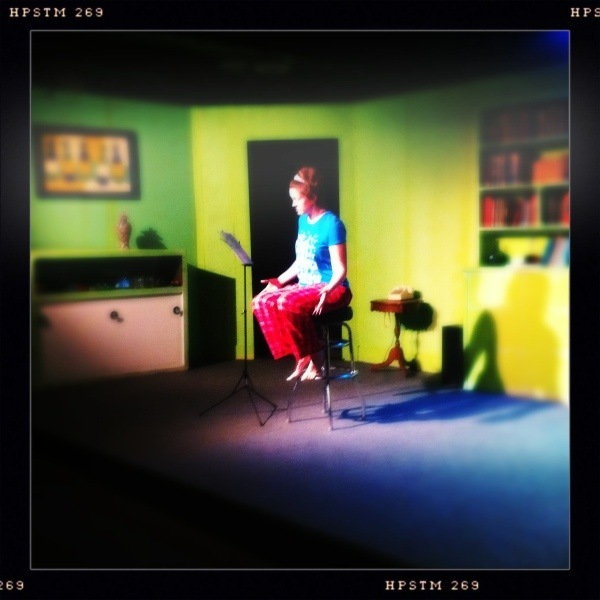 If you need to reach me personally regarding a theatrical matter, email DramaSutra@comcast.net. 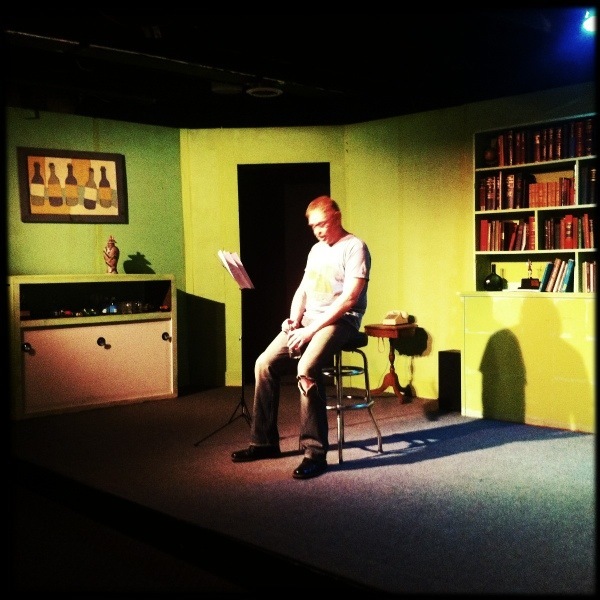 struck is an exploration of neuroscience and brain trauma. It is a poetic dance on the razor-edge of mortality, as the brain and body look for meaning and struggle to communicate, recover and re-discover the sense of “self” after a crisis. Visit www.nacl.org for video previews and more information. Highland Lake is just over an hour drive from Scranton across the NY state border at Barryville. 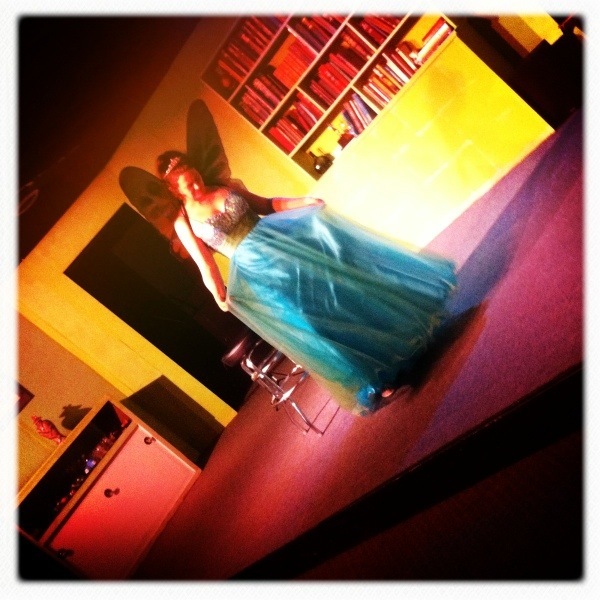 via Adam Szymkowicz: I Interview Playwrights Part 579: Lindsey Ferrentino. 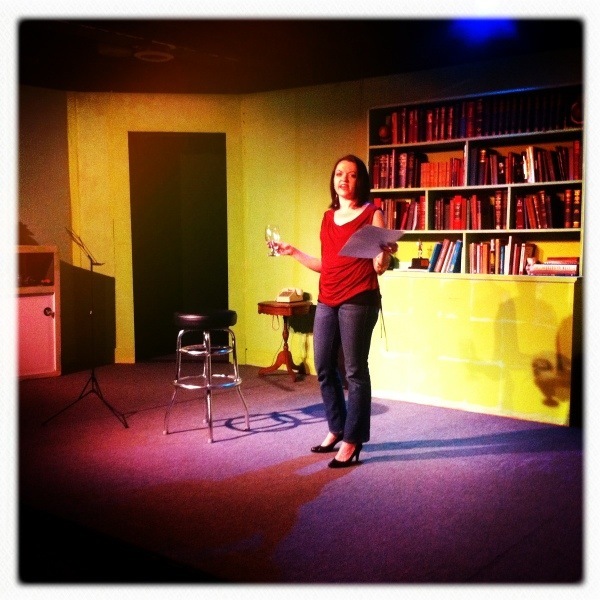 Small but enthusiastic crowd for the Rock Bottom monologue show this weekend. The program played better than I think any of us expected it to. And when that happens, it’s hard not to look around and wish more people saw you succeed. With this weekend’s perfect weather and historic flood of celebrities in town, no one needs make excuses, but a slight pout lingers. Like if you finally did your first cartwheel and Mom had turned her head. You’ll probably be able to do another one. Oh God, you hope so. But that one was special. The JMPP is ridiculously proud of all the writers and performers who continue to take risks and put themselves out there. We are growing and improving as artists. I just hope our arms don’t get tired before we have a chance to get your attention. It’s not your imagination. Storytellers are hung up on telling tales of descent, of protagonists unraveling under the strain of abusive relationships, addictions, mental disorders etc. Maybe it’s the centuries-old tradition of dividing stories into the tragedy or comedy category that’s doomed us? There are exceptions, but so many of these stories seem to end in death and destruction with the survivors facing the daunting task of rebuilding their lives. 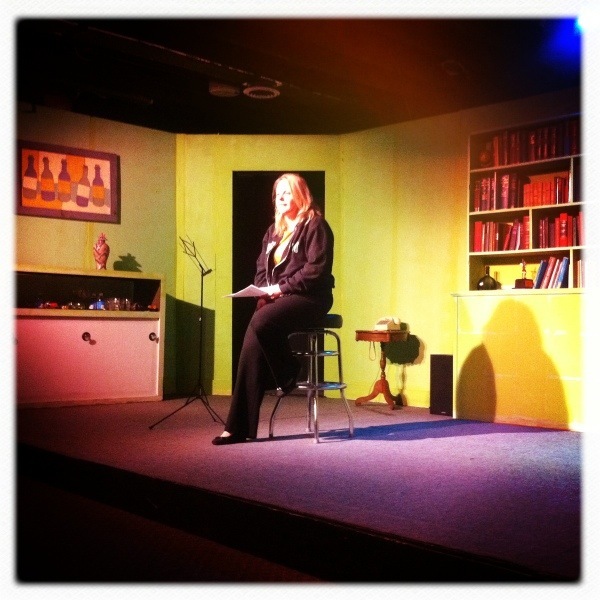 A program of new original monologues by The Jason Miller Playwright’s Program aims to pick up where these stories left us wondering. 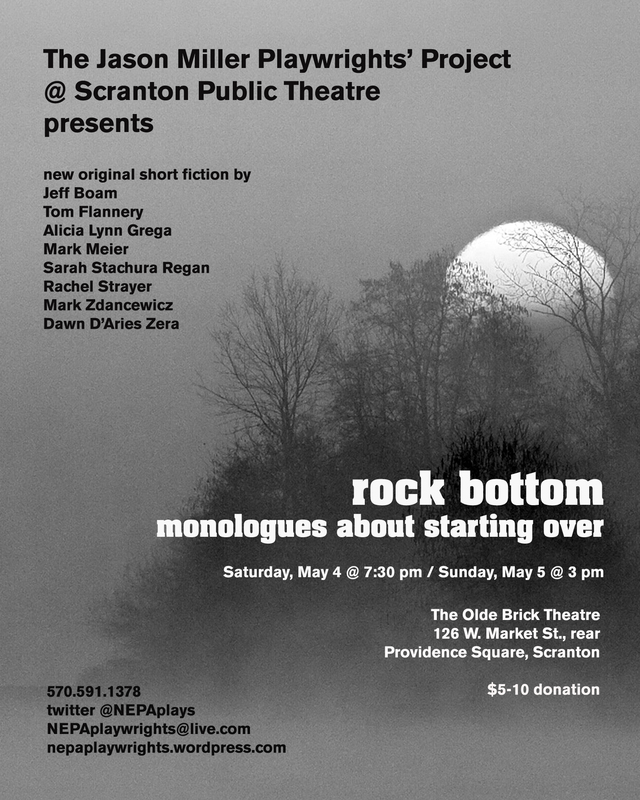 Rock Bottom: Monologues About Starting Over will be presented at The Olde Brick Theatre on Saturday, May 4 at 7:30 p.m. and Sunday May 5 at 3 p.m. Admission is by donation ($5-10 suggested) to be collected at the door. The program began as a writing challenge JMPP coordinator Alicia Grega placed to associate writers. Every serious playwright should have at least one monologue in his/her portfolio; even better if that piece can stand alone beyond the context of a longer play. While some writers have penned plays full of monologues, others, she knew, could benefit from the prompt. The result is Rock Bottom, a scaled down presentation Grega likens to a poetry reading. 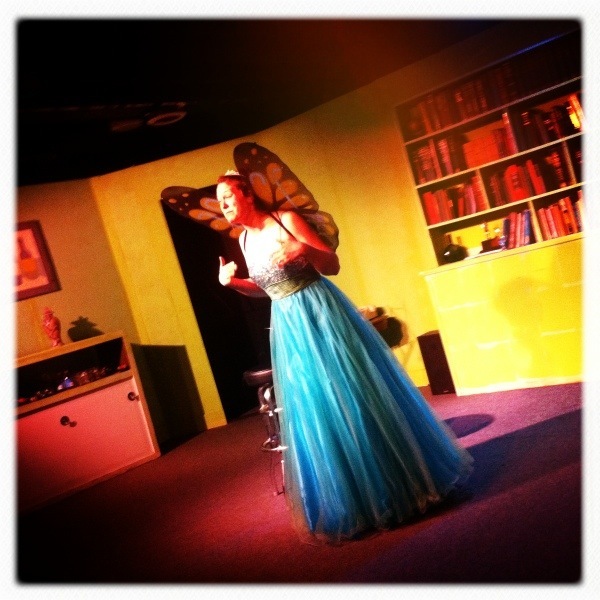 Some pieces will be memorized and performed in costume or with props or set pieces. Others will be shared bare bones from a sheet of paper by the author or an actor recruited to “pinch hit.” Participating playwrights include Jeff Boam, Alicia Lynn Grega, Mark Meier, Sarah Stachura Regan, Rachel Strayer, Mark Zdancewicz, and Dawn D’Aries Zera. The Olde Brick Theatre is located on the second floor at 126 W. Market Street just off Providence Square in Scranton. The entrance is in the rear of the building. Call 591.1378 or email nepaplaywrights@live.com for reservations (not required) or for more information. via Curtain Call: The Remi Method | the570.com Northeastern PAs Entertainment Site – the570. 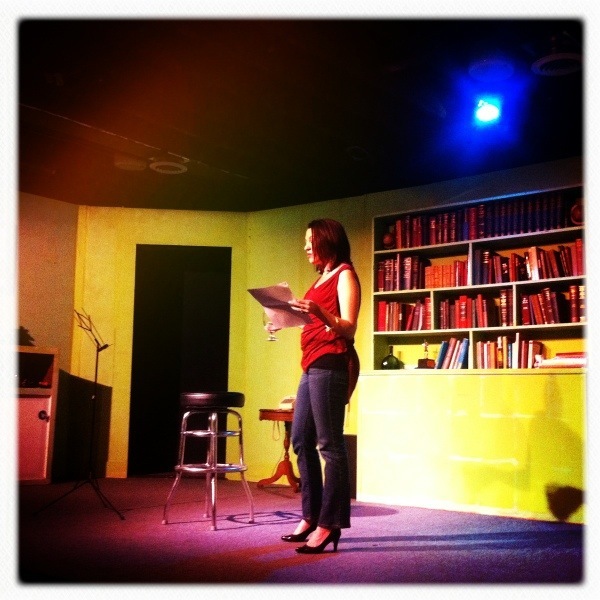 We were asked to participate by Scranton StorySlam’s Pamela Hill McNichols http://scrantonstoryslam.com/SSLM/, who was also generous enough to make a great banner for us! 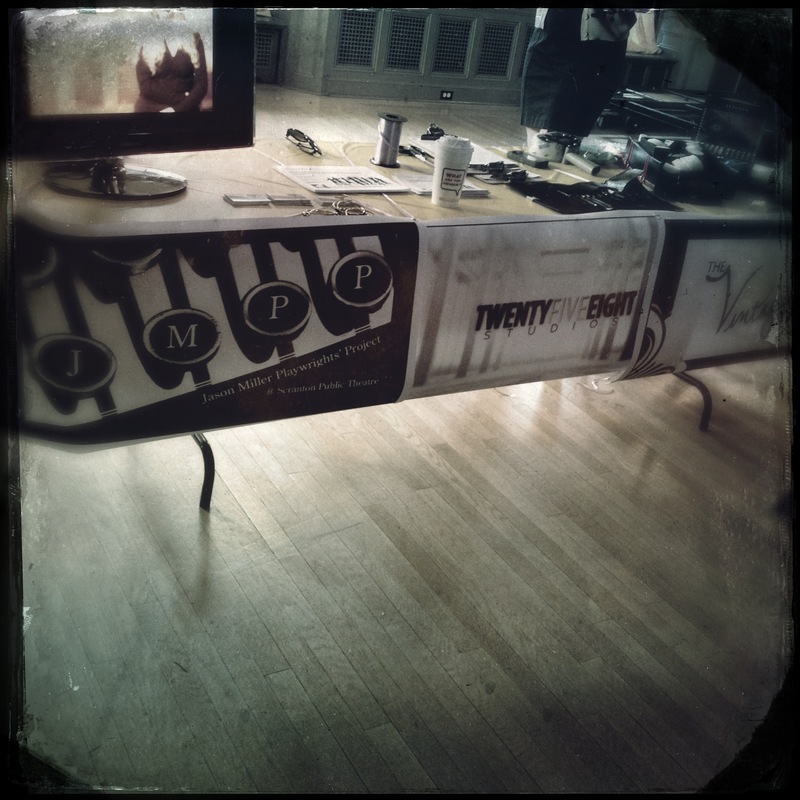 Our station was really fun, with the talents of Conor O’Brien of The Vintage Theater http://scrantonsvintagetheater.com/ and Markie Dennebaum of TwentyFiveEight Studios http://25-8productionsinc.com/ . Conor and I got to exercise our improv chops a bit and play the parts of an enthusiastic, over-the-top director and an obnoxious talent agent, respectively. It was a fantastic opportunity to tell a wide variety of people about who we are and what we do, which is always a good thing. via Portrait of an Artist: New Meaning At HumanaFest. “one who facilitates understanding of a play for artists and wider community” ??? via What The Hell is a Dramaturg?.